The Stuttgart-based Foundation for the Rights of Future Generations (FRFG) and the London-based Intergenerational Foundation (IF) jointly award the biennial Demography Prize, endowed with EUR 10,000 (ten thousand euros) in total prize-money, to essay-writers who address political and demographic issues pertaining to the field of intergenerational justice. The prize was initiated and is funded by the Apfelbaum Foundation. Spread the word! You can download a poster here: poster_IGJR. Through the prize, the FRFG and IF seek to promote discussion about intergenerational justice in society, and, by providing a scholarly basis to the debate, establish new perspectives for decision-makers. The invitation to enter the competition is extended especially to young academics from all disciplines. The Demography Prize is endowed with EUR 10,000. The prize money will be distributed proportionally among the best submissions, which can be more or less than the top three submissions. Winning submissions will be considered for publication by the editorial team of the Intergenerational Justice Review (IGJR; www.igjr.org) for the summer issue 2020. Researchers from all fields of social science, especially young researchers (students, graduates, post-docs). There is no age limit. Collaborative submissions are also welcome. In many European countries, and especially in large cities and university towns, affordable housing is a pressing and sometimes explosive issue. In the debate about such questions as home ownership or rent increase caps, the intergenerational perspective is often forgotten. But different generations are affected in noticeably different ways. Rising rent and purchase prices make it ever more difficult for young people to access the housing market. The quality of housing is a key factor in living standards and wellbeing, as well as an integral element of social integration, yet in 2014 a total of 7.8% of young people in the European Union (aged between 15 and 29) were in severe housing need, 25.7% of the young people in the EU lived in overcrowded households, and 13.6% lived in households that spent 40% or more of their equivalised disposable income on housing (Eurostat 2016). Young people often live longer in their parental homes, or in the private rental sector, than previous generations (Ronald/Lennartz 2018). In response to the 2008/9 financial crisis, government programmes for public and social housing aimed at the poorer parts of the population were cut back, leading to diminishing access to affordable housing, especially in urbanised areas. For young people, this means that they have to pay higher rents. What is often referred to as a “housing crisis” can certainly be seen as a question of intergenerational justice, because the baby boomers had easier access to housing or to the means to finance it. Today, the baby boomer generation benefits from housing inequality in two ways: through property values and rental income. At the same time, with pension systems under pressure because of ageing populations, the ownership of residential property has become an important component of retirement income (Helbrecht/Geisenkauser 2012). Younger generations, on the other hand, are disadvantaged in two respects: today’s increased demand leads to further pressure on the housing market in the low-price segment, which in turn leads to an increase in the rent burden for lower and middle income groups, and also makes the purchase of residential property more difficult. In many parts of Europe, such as the Southeast of the UK, in the 1980s the average cost of a first home was three to four times the annual average salary; today it can be ten or twelve times the annual average salary. In many European countries, ownership of real estate has become a much greater source of wealth inequality between generations than salary differentials. This gloomy picture of housing and home ownership is, however, by no means universal. Statistics point to significant differences between countries, and international comparisons show that successful housing policies are possible. An EU comparison shows that the percentage of households managed by a person aged 18–29 who spends 40% or more of their disposable income on housing costs ranges from 1.3% (in Malta) to 45.4% (in Greece) (Leach et al. 2016). It is clear that some countries perform significantly better than others in providing affordable housing for the next generation. How did the housing crisis come to be and how can housing inequality for young people be improved? What weight do different factors (such as demographic shifts, changing preferences, market or government failures) have? Why are some countries better than others at providing affordable housing for the next generation? What are the similarities and differences? What lessons can be drawn from cross-country comparisons? Planet vs. people: It is often suggested that the solution to the housing crisis is to build more homes, but this raises the question of encroaching on green spaces and the environmental impact that this implies. How can that tension be resolved? How can urbanisation and the housing market become more environmentally friendly? What political levers, such as subsidies, could be introduced to help the younger generation achieve more affordable and long-term housing security? Is the German debt brake (Mietpreisbremse) a successful instrument for this and how does it affect the young generation? What is the potential of new forms of housing, such as shared housing, multi-generational housing, homeshare (accommodation offered in exchange for help and/or companionship)? Can government policy help to bring about new usage patterns of the existing house stock, for example by incentivising the fuller occupation of large houses with unused spare bedrooms, or by discouraging the ownership of second homes through higher taxation? How does homelessness affect young people in particular and how can it be combated? How can those who work in the media be encouraged to address this topic? Note that these are non-binding suggestions: participants are strongly encouraged to come up with their own research puzzles. You may adapt the title according to your chosen subject, but the paper must in essence reflect the topic. The submitted papers should be innovative, creative and with a focus on civil society issues, with practical applications. The FRFG and IF particularly appreciate participants trying to explain complex ideas in as simple and accessible terms as possible. Submitted research papers may employ all possible methodological approaches. Eurostat (2016): Young people – housing conditions. https://ec.europa.eu/eurostat/statistics-explained/pdfscache/46039.pdf. Viewed 27 September 2018. Ronald, Richard / Lennartz, Christian (2018): Housing careers, intergenerational support and family relations. In: Housing Studies, 33 (2), 147-159. Helbrecht, Ilse / Geilenheuser, Tim (2012): Demographischer Wandel, Generationeneffekte und Wohnungsmarktentwicklung: Wohneigentum als Altersvorsorge? In: Raumforschung und Raumordnung, 70 (5), 425–436. Dorling, Danny (2015): All That is Solid: How the Great Housing Disaster Defines Our Times, and What We Can Do About It. London: Allen Lane. Dustmann, Christian / Fitzenberger, Bernd / Zimmerman, Markus (2018): Housing Expenditures and Income Inequality, Cream Discussion Paper 16/18, London: Centre for Research and Analysis of Migration, URL: http://www.cream-migration.org/publ_uploads/CDP_16_18.pdf. Viewed 24 October 2018. Eurostat (2016): Young people – housing conditions, https://ec.europa.eu/eurostat/statistics-explained/pdfscache/46039.pdf. Viewed 27 September 2018. Eurostat (2015): Housing cost overburden rate. http://appsso.eurostat.ec.europa.eu/nui/show.do?dataset=ilc_lvho07a&lang=en. Viewed 27 September 2018. Hills, John / Cunliffe, Jack / Obolenskaya, Polina / Karagiannaki, Eleni (2015): Falling behind, getting ahead: the changing structure of inequality in the UK, 2007-2013. Social Policy in Cold Climate. London: LSE. Leach, Jeremy / Broeks, Miriam / Østenvik, Kristin / Kingman, David (2016): European Intergenerational Fairness Index: A Crisis for the Young. 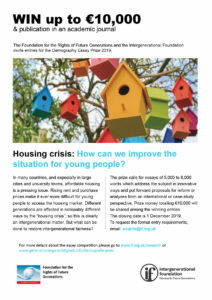 London: Intergenerational Foundation: http://www.if.org.uk/wp-content/uploads/2016/03/European-Intergenerational-Fairness-Index_Final-2016.pdf. Viewed 27 September 2018. Lennartz, Christian / Helbrecht, Ilse (2018): The housing careers of younger adults and inter­generational support in Germany’s ‘society of renters’. In: Housing Studies, 33 (2), 317-336. Morton, Alex (2013): Housing and Intergenerational Fairness. London: Policy Exchange. National Housing Federation (2014): Broken Market, Broken Dreams. London: NHF. Rugg, Julie J. / Quilgars, Deborah (2015): Young People and Housing: A Review of the Present Policy and Practice Landscape. In: Youth and Policy. Issue 114. Shaw, Randy (2018): Generation Priced Out. Who Gets to Live in the New Urban America, Oakland, CA: University of California Press. Shelter (2010): The Human Cost: How the Lack of Affordable Housing Impacts on All Aspects of Life. London: Shelter.